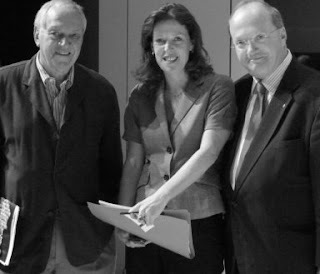 Here's a really nice pic from last week's York University forum on Mixed Member Proportional featuring former NDP Leader Ed Broadbent, Ontario Liberal candidate Kate Holloway and Tory Senator Hugh Segal. Liberal party member Adrian Dafoe took the photo and provided it to this site. Halton Liberal MP (and former Progressive Conservative) Garth Turner has endorsed the Citizens' Assembly's recommendation for change on his blog. Vote For MMP has launched radio ads across the province. Listen out for them. Here's a link to the English version and a link to the French version.